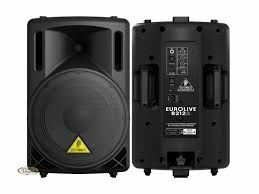 The Behringer Eurolive B212A is an active 2-way PA speaker that features 400W power, a 12" long-excursion woofer, a 1-1/4" titanium-diaphragm compression driver with horn, and a versatile enclosure design that allows positioning for use as a monitor or main. You also get ultra-low noise mic (XLR) and line (1/4") inputs with level control and 2-band EQ plus an XLR out. It also has speaker protection, a 35mm polemount, and ergonomically shaped handles.